I decided to work on the block I designed in Teotitlan in Mexico. The drawing actually represents what I saw as I sat on my balcony. the roof tiles on the building opposite the apartment. The red things hanging are the pomegranates on the trees in the courtyard. The leaves across the center of the block are from the pomegranate tree. 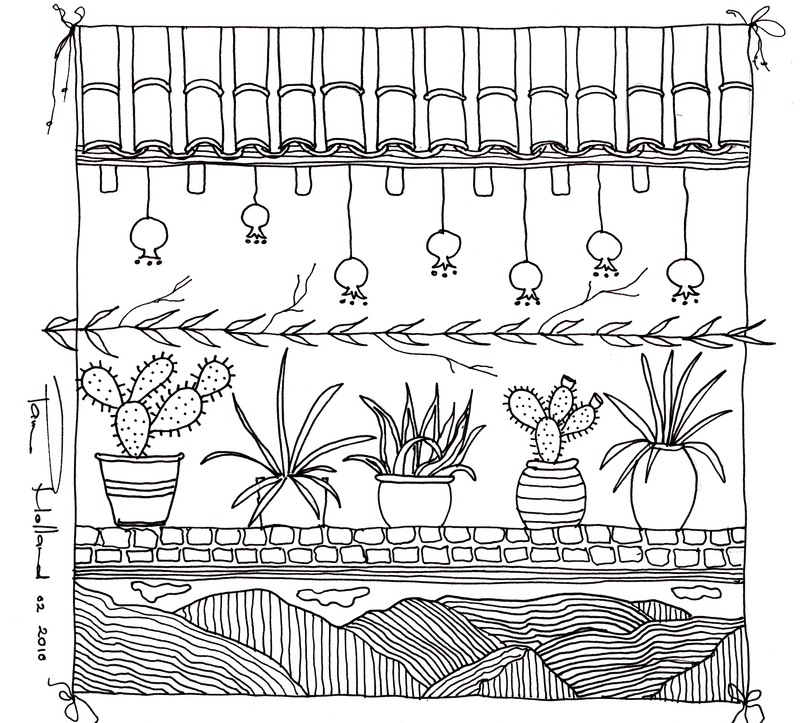 Then I drew each of the pot plants surrounding my balcony and the cobblestone road below and finally the blue sky with the hills in the distance. But somehow I need to represent the sounds I heard so maybe I need to draw a rooster on top of the roof…. I don't think I'll add the turkey and the donkey.. The bands and the music….!!! I pretty much like the drawing as it is. it's simple and makes a statement… now that I've described it to you I guess it has more meaning. 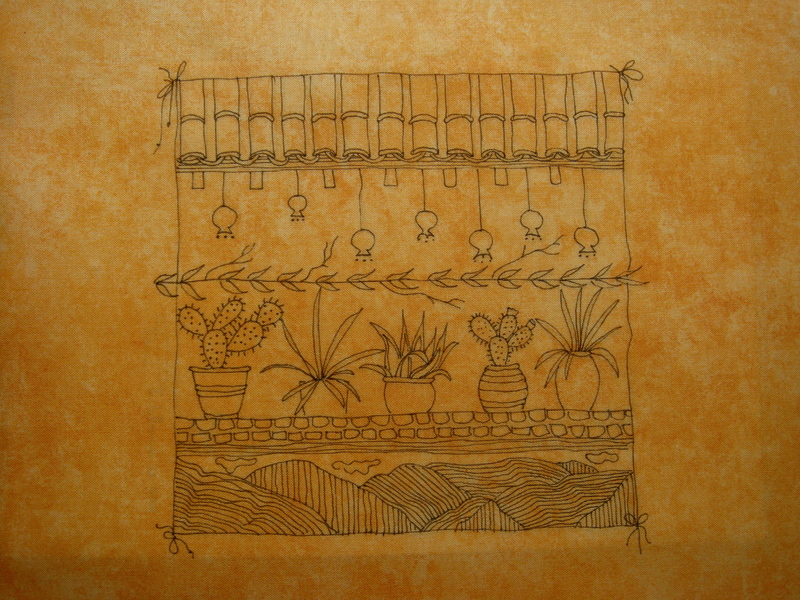 I decided to create an illustrated block, but using both ink and pencil. It's a little tricky, but I'll explain. The pencils work better if they are waxy… so I normally would use prisma pencils but the ones I used in this block were Derwent Colour Soft. You need to apply the ink first and then add the pencil because the ink pen gets caught in the wax consistency of the pencil and seems to stem the flow of ink. 1. 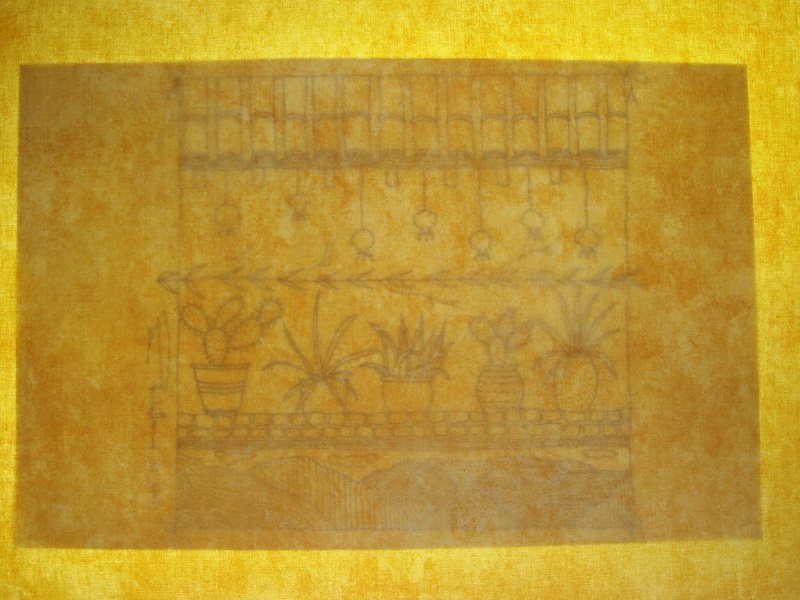 I traced the image onto mustard colored fabric by putting the original drawing on the light box and tracing the image with a black .5 pigma pen. Place it on the light box. I could just quilt on the lines in black thread, it would be an interesting piece… but I need to explore something new each week, so I decided the try the ink pencil combination. I have done it before, but not necessarily in this manner. So which is the pencil and which is the ink? First of all it's a challenge drawing on a colour as dense as this one…. but I quite like it. It's mellow. The pencil gives a soft glow to the piece. A little of the surface color may wear off with constant handling, but… once quilted this will be packaged for viewing by students… and I have a big sign on the pack saying "Please don't open"
Quilting… I'm excited about that because I think I will continue some of the drawn lines. I'll explain. If you look at the hill in the left hand corner at the bottom of the picture. I will begin the quilting line from the outer border, picking up the design on the block and continuing down the the other outer border. 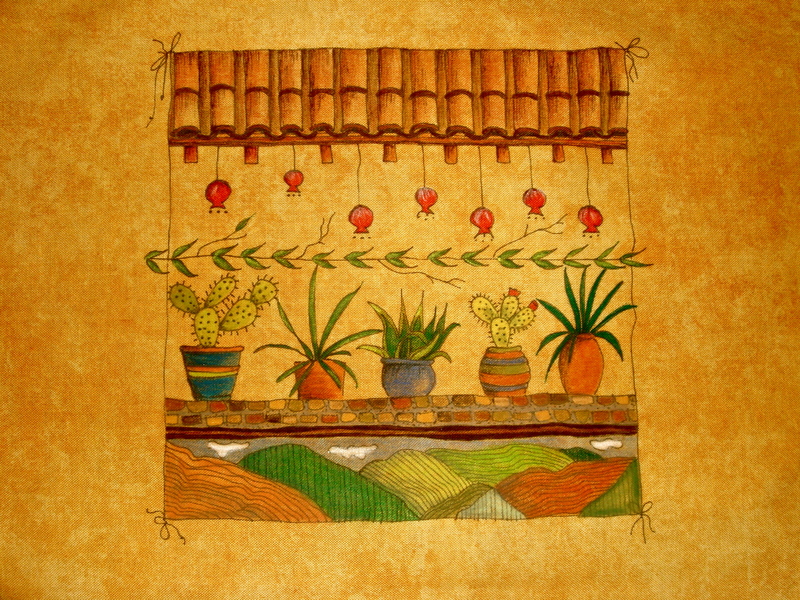 The Pomegranate leaves… I can take them from one border to the next….. etc. etc. So I'll quilt it tomorrow and I have to edit film and quilt for ….XXXXX……. hours on the Rhino. I cleaned the studio today… I just can't work in an untidy studio….. Strange but true now I'm ready to work. Previous PostI’ll give it a go. Next PostChallenge block from mexico.